by more than 84,000 tonnes and provided a service to their customers. Businesses can gain a competitive edge in a number of ways. Efficiency: Good waste management should be easy for staff to engage with, occupy only as much space as needed, and limit the expenditure of unnecessary resources. When combined, these features will improve overall efficiency. Reputation: Taking responsibility for waste and environmental impacts gives a workplace the opportunity to demonstrate a point of difference from competitors. Informing suppliers, customers and stakeholders of achievements is a simple and positive way to improve organisational reputation. An increasing number of government and other tenders now require evidence of environmentally sustainable practices. Recycling can help win contracts. Customer Service: In some cases a business can provide a service to their customers that has a benefit for both. O-I Australia, the largest manufacturer of glass bottles in the country, introduced a Returnable Packaging Program for commercial suppliers. This program reduced waste to landfill by more than 84,000 tonnes and provided a service to their customers. Australia Post has adopted a number of progressive recycling programs for their customers including 'Cartridges 4 Planet Ark', MobileMuster and the Nespresso Coffee Capsule Recycling Service. From a business perspective, providing these services to their customers drives foot traffic into Australia Post outlets and demonstrates an organisational commitment to the environment. 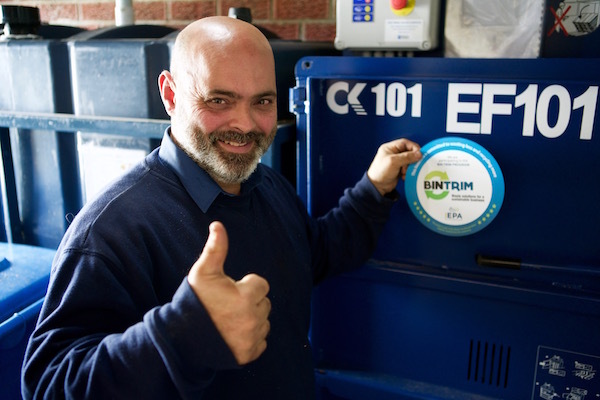 After installing a baler, Galluzzo Fruiterers, a local grocer in Glebe, reduced their cardboard waste from 7 wheelie bins a day to just 2, delivering an estimated waste management saving of $12,000 a year. The changes also resulted in a more available shop space and more time for staff to spend with customers. Galluzzo Fruiterers saved time, space and money after installing a baler. Joe Galluzzo said, "Imagine this place full of people. We serve almost 250 people a day. Then imagine all the fruit and veg, and all the cardboard boxes piled up in the back. It was making it really hard to move about and get things done properly." Identify examples of wasteful, costly or inefficient practices. Provide suggestions for improving these processes and where possible quantify time, money or space savings. Outline opportunities for promoting successes to customers, suppliers and stakeholders that will improve your organisation’s reputation. Look for opportunities to assist customers or suppliers to improve their own environmental impacts, where relevant, as a way of building loyalty. Download the full guide to promoting the benefits of recycling at work.